Our diocesan Convocation The Joy of the Gospel in South Jersey was a landmark gathering of laity and clergy in the life of the Church of Camden. It was formed in response to the invitation and challenge of Pope Francis in EVANGELIUM GAUDIUM (The Joy of the Gospel) to be missionary disciples of Jesus Christ. In EVANGELIUM GAUDIUM Pope Francis urges the Church to move forward on a “path of pastoral and missionary conversion which cannot leave things as they presently are”(EG, no.25). 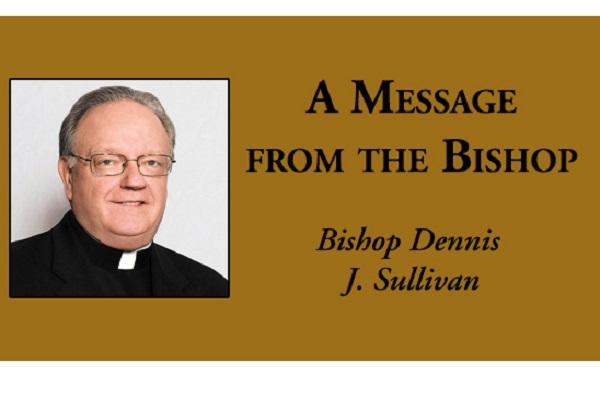 Bishop Sullivan celebrated Mass at the diocesan Convocation of Catholic Leaders: The Joy of the Gospel in South Jersey last week in Atlantic City. 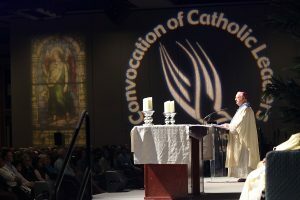 The 800 participants at the Convocation listened to key note addresses given by distinguished speakers, experts in their particular topic; attended workshops on a variety of pastoral issues and concerns; actively participated in daily liturgies, Morning Prayer and Mass, accompanied by beautiful and varied styles of music and congregational and choral singing; attended an evening of Adoration; gathered in parish groups to work on a “parish plan”; shared conversation at daily meals; visited exhibitors’ booths to gather information; found time for the Sacrament of Penance and private prayer before the Blessed Sacrament and enjoyed intermingling and meeting with sister and brother Catholics from across the diocese who love their parish and our Church. The attendees at the Convocation were filled and charged with the Holy Spirit and hopeful for and committed to our Church in South Jersey. The work of the Convocation continues in each parish as the experience of the Convocation is shared with all parishioners and the parish delegates continue their deliberations. Our Convocation leader, Donna Ottaviano-Britt will see to that in the months ahead as she meets with the Point Delegate Leaders of each parish group to encourage the formation of missionary disciples. The Convocation began on the Solemnity of the Annunciation to Mary who was chosen by God to bear in Her Immaculate womb the Son of God. Her maternal presence was felt throughout the four days of the Convocation, helping us become missionary disciples of Her Divine Son and encouraging us to accept responsibility for building up our church in each parish in our diocese. 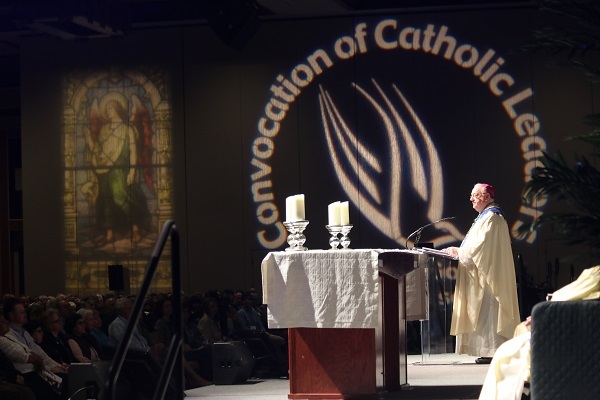 I share with you excerpts from my homily at the final Mass and I urge you to speak with those from your parish who attended the Convocation, so that you can catch the fire of the Holy Spirit that was experienced by them. The prophet Jeremiah counsels us that if we want to flourish spiritually there are two things we have to do — the first is LISTEN and the second is WALK. LISTEN to God’s voice and WALK in God’s ways. Brothers and Sisters, we have spent the last four days listening to many voices who have come to speak to us and LISTENING to one another in our breakout sessions and at our parish tables. Now it is time to WALK. And, not just any walk but to walk as Missionary Disciples. To walk as leaders. For the prophet Jeremiah the listening organ of the body was not the ears but the heart. Jeremiah was called by God to break through the hearts of the people of Judah with the Word of God. He laments that the people have failed to respond to God and failed to live the obligation of the covenant that God made with them. Let us praise and thank God for all whose words have been hammering at our hearts these past four days. May our hearts be softened by what we have heard and by what we have shared during this Convocation. May what we have listened to pierce our hearts and be turned into actions on behalf of our church on behalf of your parish. Haven’t you listened to God’s voice in the keynote addresses; in the panel discussions; in the breakouts; in the praying and hymn singing of this assembly; in conversations with one another? “If today you hear his voice, harden not your hearts.” Psalm 95, our response to the prophetic reading. Let it be today and be tomorrow and be the many tomorrows of our lives that we hear His voice as we bring the Joy of the Gospel in South Jersey. You are God’s people. You are Christ’s Body. You are the Church at Camden. It is my hope that you feel more like God’s people. It is my hope you feel more like Christ’s Body. It is my hope you feel more like the Church of Camden after what you have experienced during this Convocation these past four days. Jesus encountered a crowd after the healing of a mute man; they accused Him of doing the work of Beelzebub, the prince of demons. He had done a good action but it was suggested that he acted with an evil spirit. One would think the crowd would have been happy with Him. That’s the human situation, isn’t it? Some people are never pleased. And, that still goes on. As we say in New York where I’m from, forget about ‘em, forget about ‘em. It’s time to get movin’ for Jesus. It’s time to be Tabernacles with feet as Julianne Stanz suggested on the opening day of our Convocation! It’s time to wade in the water as ValLimar Jansen reminded us on Monday night! It’s time to Rise and Shine as Carolyn Woo encouraged us yesterday! It’s time to re-read the Gospel and walk on the shoulders of the giants who have gone before us as Professor Ospino urged us on Tuesday, the second day of our Convocation! It’s time for Mercy and Mission as His Eminence Joseph Cardinal Tobin preached to us. And, it is time to get our shoes dusty as Chris Lowney reminded us this morning. We’ve got a story to tell; let’s tell it! Today is opening day for your team, the Phillies, (notice I said your team). May I suggest that the Holy Spirit has been very active among us these past four days, a movin’ and a blowin’ and bringing us to the end of our gathering. Today is Opening Day for your parish in which you will Walk and Listen with all you have picked up and experienced in the events of this Convocation so that our Catholic Church in South Jersey may flourish with the Joy of the Gospel. Amen. We began on Mary’s Feast, let us turn to Her as we depart. Permit me to end with one of my favorite Spanish hymns to our Blessed Mother. Santa Maria del Camino. It translates like this — As life goes on You are never alone. With you on the journey Holy Mary walks. Come with us as we walk our journeys. Accompany us Holy Mary. Holy Mary walk with us! O Holy Mother of God Walk with us and help us Listen to your Son, Jesus Christ. Amen.